My first view of "Birch Bay". Beautiful hues of greens and grays. Cool and cloudy. 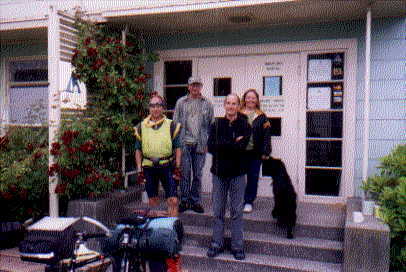 Fellow hostellers ready to hit the road on bikes. 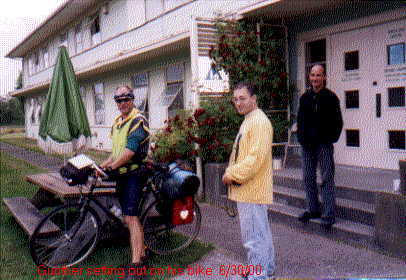 This hostel used to be part of a military base. 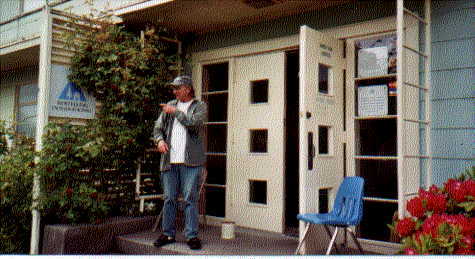 The rooms are the old barracks. Every two rooms shares a bathroom. 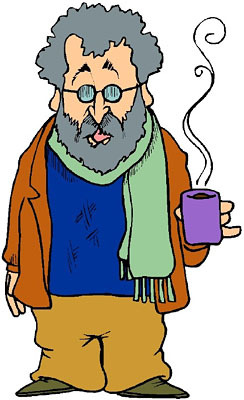 There's often enough unoccupied rooms that it's quite possible to end up with your own private room. 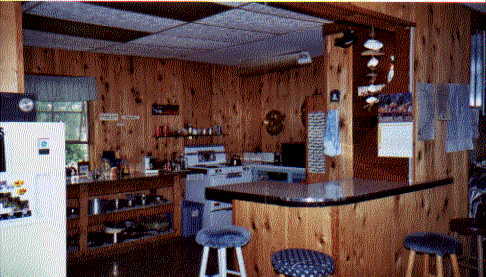 Right: The kitchen. 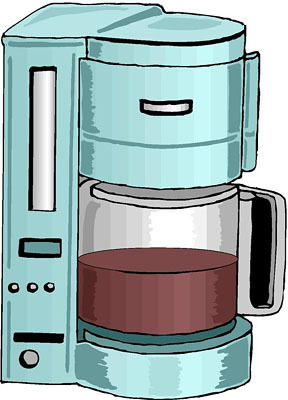 Plenty of coffee and Pancake breakfasts here! 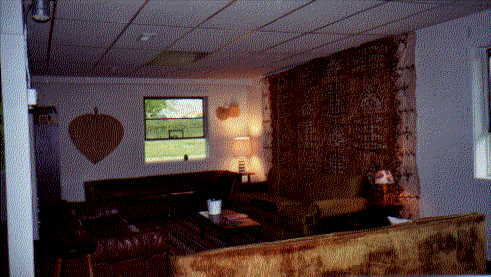 Right: The den. Wayne's friend brought over slides of his past trips. We enjoyed watching slides about Italy and Alaska. 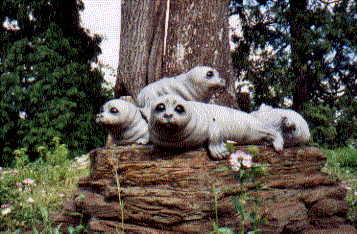 During my stay at the hostel, Wayne showed me the sights around Blaine. Above: The "Peace Arch" between Canada and the US. 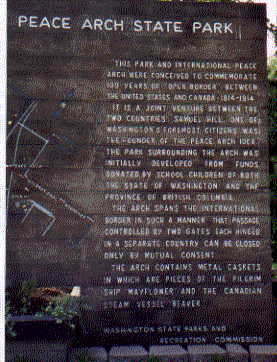 "This park and international Peach Arch were conceived to commemorate 100 years of "open border" between the United States and Canada: 1814-1914. It is a joint venture between the two countries. 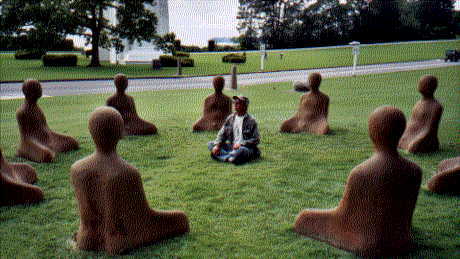 Samual Hill, one of Washington's citizens was the founder of the Peace Arch idea. 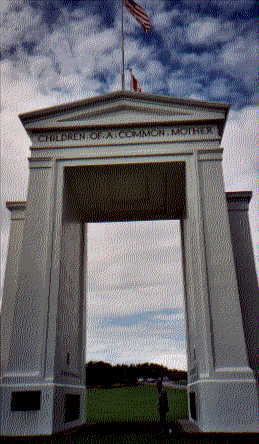 The park surrounding the arch was initially developed from funds donated by school children of both the State of Washington and the Province of British Columbia. 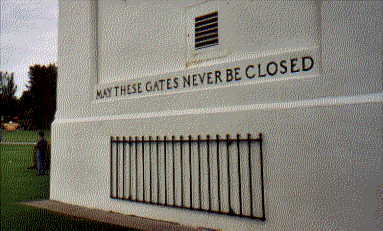 The Arch spans the International Border in such a manner that passage controlled inbetween the two gates each hinged in a separate country can be closed only by mutual consent. The Arch contains metal caskets in which are pieces of the pilgrim ship 'Mayflower' and the Canadian steam vessel 'Beaver.'" 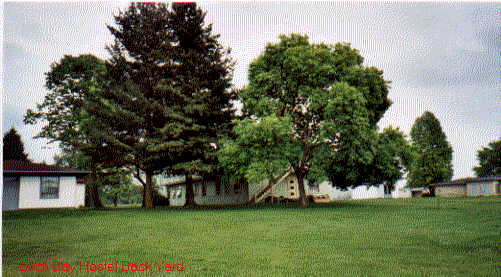 Right: Large, grassy backyard. Volley ball anyone? During my stay in Birch Bay I had the opportunity to visit the International Sculpture Expedition held in the Peach Arch Park. 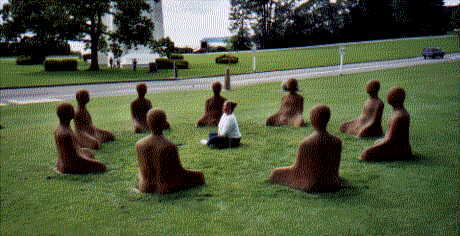 Above: We couldn't resist sitting amoung the cross-legged sculptures. 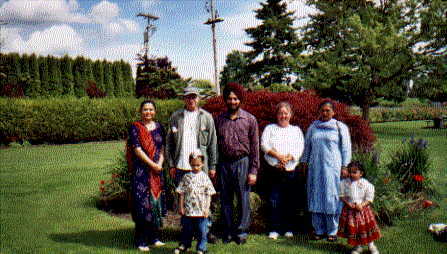 Right: Here's a family from India. We asked them to take our photo. Then we took theirs. Fun day! 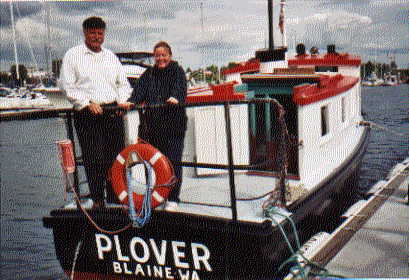 One of the things that I really enjoyed in Blaine, was riding the "Plover" to the "Inn at Semi-Ah-Moo". Left: Here's the Plover Pamphlet. 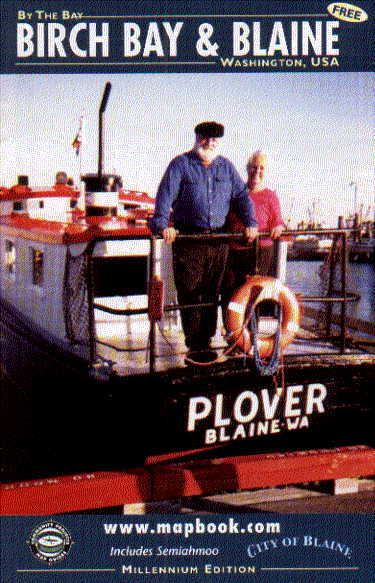 "In June 1997 the National Park Services listed Motor Vessel "PLOVER" on the National Register of Historic Places. Only a handful of vessels in this Register are from the State of Washington. 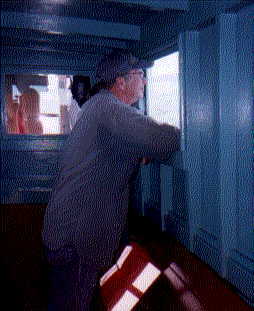 Above: Wayne gazing out to sea from the Plover window. Above: Captain Sturgill and me on the Plover. 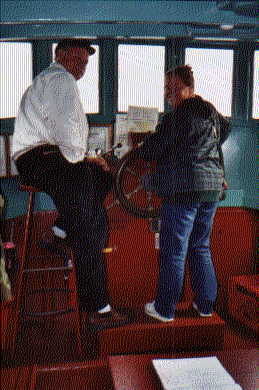 Left: Captain Sturgill let me steer the Plover! 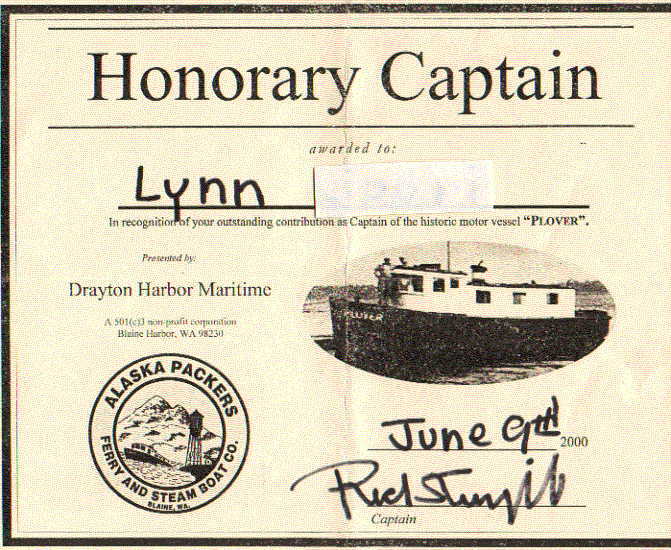 Then they gave me the "Honorary Captain's Certificate" in the photo below! 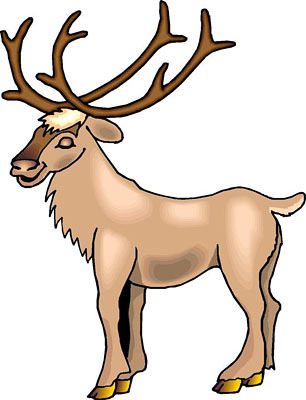 Well, I've been thinking about it for a week...Yup, I decided to do it--I'm driving to Alaska!